HERE'S THE GROW-MICRO-BLOOM BASE NUTRIENT BREAKTHROUGH YOU'VE BEEN WAITING FOR!Until now, growers who were looking for an inexpensive, 3-part base nutrient formula had to settle for the industry's common brand. They had to suffer because:Most 3-part formulas are NOT made specifically for the demands of high-profit hydroponics plant growers like us...Many include artificial dyes of an unknown amount and a molecular structure which could harm plants like ours (compared to harmless, organic dyes)...And when you use these common brands your plants are not getting fed the right mixture of nutrients they desperately need for vigorous growth and impressive blooms!But now, all that is about to change.After thousands of man-hours and hundreds of laboratory experiments, Advanced Nutrients has just released their newest 3-part base nutrient formula for growers of all levels called JUNGLE JUICE™.With this breakthrough formula, your plants get all the nutrients they need, exactly when they need them... JUNGLE JUICE™ MICRO: starts your plants off right and gives them the foundation they need by feeding them high-quality Nitrogen, Iron, Calcium, and other trace elements in the precise amounts our high-profit plants demand... 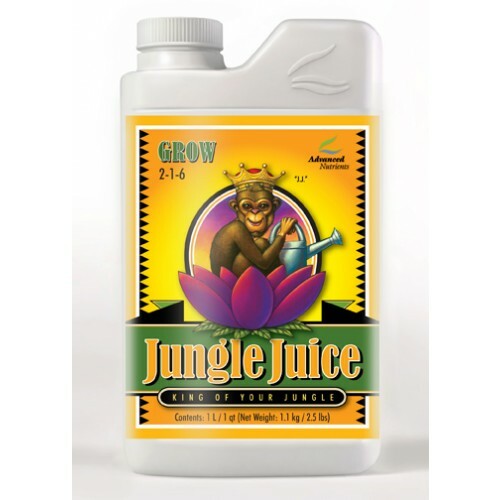 JUNGLE JUICE™ GROW: provides the Nitrogen, Phosphorous, Potassium, and secondary minerals necessary for the types of plants we grow to THRIVE during the all-important vegetative phase... and... JUNGLE JUICE™ BLOOM: gives your plants the Phosphorous, Potassium, Magnesium, and Sulfur they need to bloom big and juicy buds and give you the maximum yield! HERE'S 5 REASONS WHY YOU SHOULD PUT JUNGLE JUICE™ TO THE ULTIMATE IN-HOME TEST WITH YOUR PLANTS, TODAY! You'll find you save money when you compare JUNGLE JUICE™ to the industries common brand... JUNGLE JUICE™ was designed from the ground up for growers like us and is guaranteed to meet your very specific demands and expectations for hydroponics nutrients... JUNGLE JUICE™ is guaranteed to feed your plants the specific types of nutrients they need at every stage of their start, growth, and bloom phases... JUNGLE JUICE™ is guaranteed to mix easily and quickly in your reservoirs... JUNGLE JUICE™ is guaranteed to work for you... and... perform better than the industries common brand... OR... you get all your money back! YOU'RE GUARANTEED TO GET GREAT GROWTH AND YIELDS WHILE YOU SAVE MONEY, WITH JUNGLE JUICE™!Advanced Nutrients is so serious about the JUNGLE JUICE™ formula that they offer a full-money back guarantee of satisfaction. Here it is, in the founder's own words:HERE'S HOW TO SETUP A RISK-FREE TEST OF JUNGLE JUICE™ IN YOUR HOME TODAY...First, before you start your next crop cycle, select an equal amount of clones, seedlings or transplants to use with JUNGLE JUICE™. Call this your "test" crops.Then, simply go to your favorite retail shop that carries Advanced Nutrients products and tell them you want to try out JUNGLE JUICE™ absolutely risk-free.Next, when you get home, mix JUNGLE JUICE™ exactly as directed and add it to one set of your clones or transplants. Add the common "industry standard" to the other half of seedlings.Then, you want to sit back and watch! Compare the two sets of plants as you tend to them day-by-day... and... keep an eye on the set of plants you're using JUNGLE JUICE™ with...Watch your plants power through their growth phase. Enjoy seeing them get greener, look stronger, and look healthier. And finally, enjoy watching them hit the bloom phase stronger than ever before... and... produce the biggest, juiciest, smelliest, most potent buds possible!Lastly, after you harvest, you need to compare your two sets of crops to each other and ask yourself two very important questions: Which set of test crops looks better? Did JUNGLE JUICE™ give me a better overall value? ...And if you're like our thousands of other customers who have put their plants to the JUNGLE JUICE™ test... then... you'll find yourself answering a resounding "YES!" to both questions.